Welcome to this episode of the Real Fast Results podcast! Today, Rita Emmett is in the house! Rita is an expert who helps people overcome their tendency to procrastination and to become more efficient. Last time she offered her advice on this show, it was so well-received that she was invited back. Not only does she help guide people with their problems through her work, but she is also a bestselling author of four books. The first is called The Procrastinator’s Handbook: Mastering the Art of Doing It Now. This was the topic that she covered on the last show she was on. The second book was The Procrastinating Child: A Handbook for Adults to Help Children Stop Putting Things Off. One of her most recent books covers the topic which will be discussed today. It is The Clutter-Busting Handbook: Clean It Up, Clear It Out, And Keep Your Life Clutter-Free. The promise we can make today is that we will help you understand being a hoarder, a pack rat, or a clutter collector is not a personality trait that we’re born with. It’s not a character flaw. It’s not like, “Oh, this is how I am, and this is how I’ll always be.” It’s a habit, and that habit can be broken. Why should you listen today? Well, if you have plenty of space, the clutter doesn’t bother you, and there are no emotions involved, you probably don’t need to listen. But, if you would like to get rid of some of your clutter, if you would like to feel like you’re in control of it and on top of it, then you’ll want to listen. 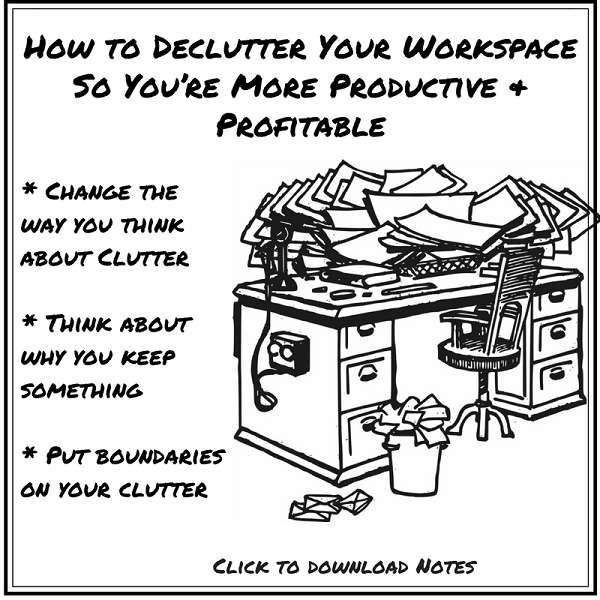 I feel like most of us have discovered that if you have clutter and chaos in your workspace and living space, you have clutter and chaos in your mind and in your heart. My website is RitaEmmett.com. I have a free tip sheet on there that you can sign up for. It is delivered via email once a month, and it’s always focused on procrastination, clutter, or stress. You can turn around and use it in a blog, use it in your newsletter, and so on. That’s one way. I know that people learn in different ways. So, I have these books that were mentions, I have online courses, and I have audios, and DVDs, and I’m a speaker. My email address is remmett412@aol.com.